FRONT ROW! Second level with amazing views! Complete casita with full kitchen, king sized bed, ceiling fans, private observation deck (the best place in Todos Santos) with million dollar views. Bright and airy with high ceilings and many windows. Private entrance, off road parking, peace and quiet, breathtaking 360 degree views of the Pacific Ocean and Sierra Laguna Mountains. The Todos Santos sunsets are second to none and you have the best seat. Born and raised in New York City and have always had an affinity for the sea. My ancestors and modern family hail from the island of Ithica, Greece perhaps explaining my love for the sea and seafood (and lamb). I caught my first fish when I was 5 years old and it's more like I was the one who got hooked that day. In 2004, my wife and I took our first trip to Cabo to go fishing and once again I got hooked only this time it was on this beautiful area. I purchased my first lot in Cabo only later to discover Todos Santos where my dream of living on the waterfront came true. I worked most of my life in sales selling everything from flower seeds, foods and food services, steel, plastic, paper and advertising space. In my latest years worked as a vessel assist captain on the east end of Long Island assisting vessels in distress. I attended Cal Poly San Luis Obispo, CA. for 2 years, lived in Osaka, Japan for 2 years then moved to SF and the Bay area for 4 years and L.A. for 10 years. Spent 8 years in Fort Lee, NJ and the last 11 years I've lived in the Hamptons of NY. After my first visit to Cabo, I became very interested in the area. I was back the following year to buy something. I was really looking for a condo but the deals kept slipping through my fingers and Real Estate was red hot then. I eventually settled for a lot on the corridor but I wasn't satisfied. Still looking for a condo or house in Cabo without success my broker invited me to look at some lots in Todos Santos. He showed me a beachfront lot with, wouldn't you know it, a bait ball working its way down the beach....hooked again!! After making plays for no less than 4 other lots, that fell through, I finally closed on this lot sight-unseen and built this fabulous house. The beautiful blue Pacific and sea breezes. Not too hot in the summer and more importantly not cold in the winter. Perhaps the most ideal climate on earth. Walk out your door and catch fish! The La Pastora surf break is a stones throw away and can be seen from here. Fishing charters available, boat or surf. One couldn't get a more expansive, peaceful vista than Mark's place. Whale View Inn is wonderful, with a sparsely populated, long, clean beach on which to walk, run and just sit, the ocean breeze refreshing the air, and the turtle hatchery nearby... not to mention that we saw numerous whales breaching, flukes and fins slapping even late in the season. Great bird life, too. We spent a lot of time writing and reading on the generous patio space, which is both covered and uncovered, protected when the breeze is a bit cool, and shady when the sun is too hot. We loved our deeply relaxing stay. Mark was a very kind and solicitous host while also being unobtrusive and quiet. The bed, firmer than our own, surprised me at how comfortable it was. The kitchen had a supply of very good pots and pans, and Mark took note of my suggestion for a few smaller mixing bowls and food containers, if one were wanting to bother with cooking. A perfect spot for two people wanting a quiet retreat. Mark was a gracious host and provided us with all the info we could want on local activities. The house was beautiful as pictured in the online photos, although we were a bit disappointed to realize the set up is more of a studio without a separate bedroom. The kitchen was well equipped to do the cooking we wanted to with good quality cookware and a gas stove which we prefer but no microwave to heat up any leftovers we brought home from eating out. There's plenty to see in Todos Santos to satisfy a couple of day trips and we especially enjoyed mark's suggestion to eat at Los Adobes, a hidden gem tucked away against a beautiful succulent garden. Probably or biggest issue with the location that we should have realized before booking is that with the western exposure there's really no place to escape the sun in the afternoon and evening except for going inside. All in all, we loved staying here with the virtually private expanse of ocean and miles of beach to walk in both directions. The crashing waves were wonderful to fall asleep to and the temperature at night was perfect for sleeping. The Pacific Ocean and the Sierra de la Laguna from your morning coffee spot!!! We will definitely be back. Thanks Mark. John and Gail are the nicest guests anyone can ask for! They took exceptional care of the property and very very nice people. I would have them back in a heartbeat! Thank you. What a beautiful place! We enjoyed the sparkling clean and comfortable accommodations, very helpful host and beautiful beach complete with whales. Will definitely plan to return. Best view in town. On the beach! There is no place in Todos Santos with a better view than the Whale View Inn. Clean, spacious accommodations. 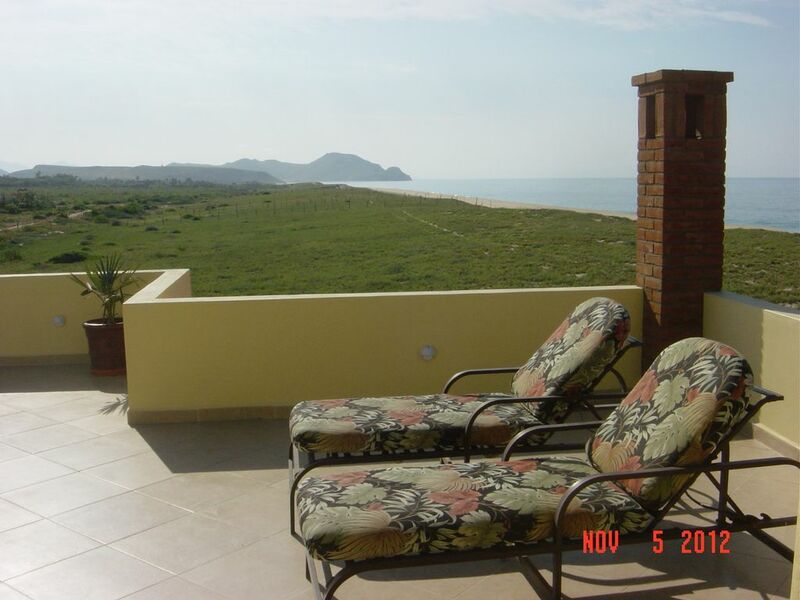 Huge patio right off the 2nd floor bedroom that affords a spectacular view of the ocean for 180 degrees. Whales going by every ten minutes. 100 yards to the beach. 5 minute drive to town. Helpful owner on site. We'll be back. Spacious covered and uncovered decking and frequent whale sightings. One block from turtle hatching release location. Good restaurants in town and nearer to the unit. The unit is comfortable and clean with good wifi. Mark the host is available, informative but not intrusive. Located on the Pacific coast 45 miles north of Cabo San Lucas. Many people come to Todos Santos (Pueblo Magico) for surfing, the art galleries, fine dining, the wonderful climate and beauty but, for me it is the fishing. Whether from the beach or panga, Todos Santos is also a fishing village with some very good fishing. Fishing charters available from boat or beach. $50.00 departure fee plus 16% bed tax and refundable $200 security deposit. Reservations may not be changed.